The Japan Meteorological Agency (JMA) launched the Emergency Warning System on 30 August 2013. 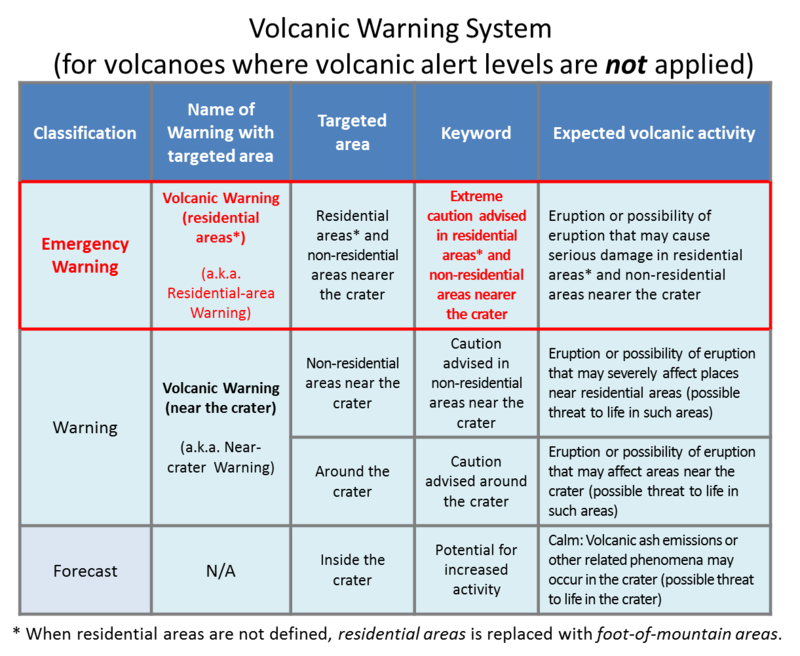 Emergency Warnings are issued to alert people to the significant likelihood of catastrophes in association with natural phenomena of extraordinary magnitude. Residents should take all measures possible to protect themselves in the event that an Emergency Warning is issued. What is an Emergency Warning? 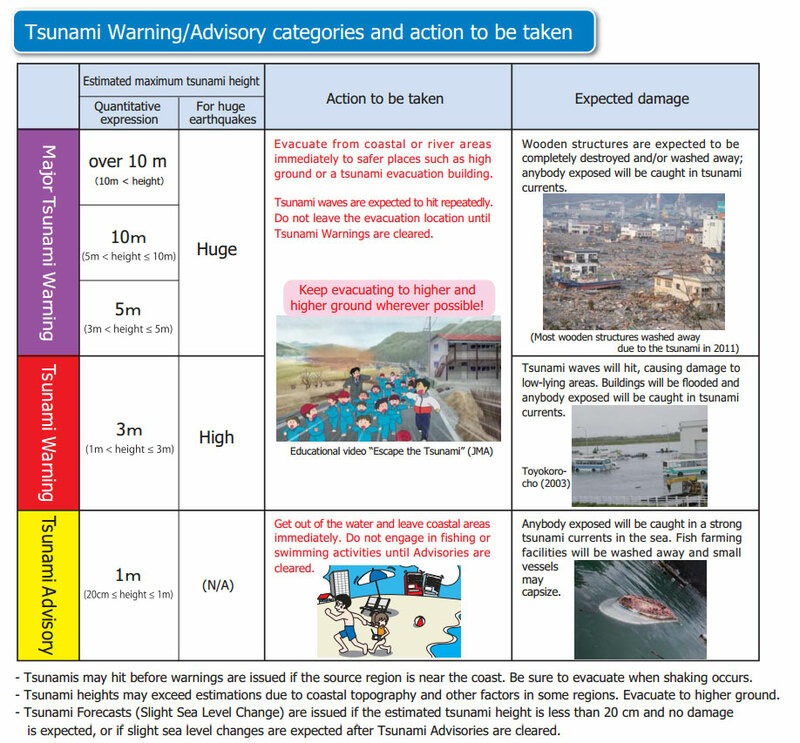 JMA issues various warnings to alert people to possible catastrophes caused by extraordinary natural phenomena such as heavy rain, earthquakes, tsunami and storm surges. 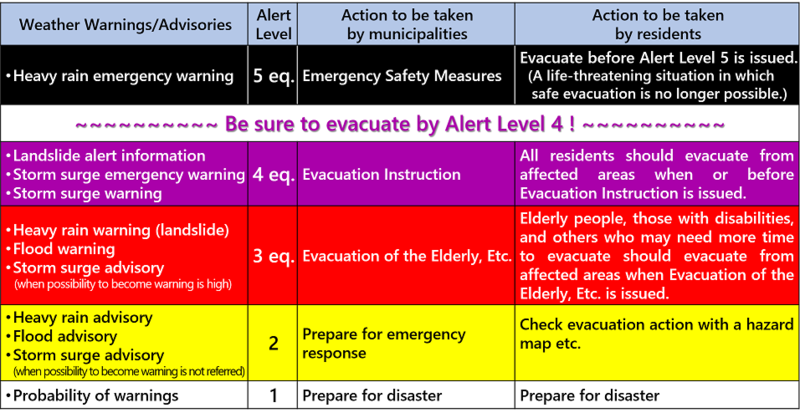 In addition to such warnings, advisories and other bulletins, JMA started issuing Emergency Warnings to alert people to the significant likelihood of catastrophes if phenomena are expected to be of a scale that will far exceed the warning criteria. Emergency Warnings are intended for extraordinary phenomena such as the major tsunami caused by the 2011 Great East Japan Earthquake by which 18,000 people were killed or left missing, the 1959 storm surge in Ise Bay caused by Typhoon Vera, by which more than 5,000 people were killed or left missing, and the 2011 heavy rain caused by Typhoon Talas, by which around 100 people were killed or left missing. The issuance of an Emergency Warning for an area indicates a level of exceptional risk of a magnitude observed only once every few decades. Residents should pay attention to their surroundings and relevant information such as municipal evacuation advisories and orders, and should take all steps necessary to protect life. Emergency Warnings are intended for extraordinary phenomena expected to be of a scale that will far exceed the warning criteria. Warnings and Advisories continue to be issued in their current form even after the introduction of Emergency Warnings. Residents should not let down their guard even if no Emergency Warning is currently in effect in the area. It is important to take action early wherever possible with reference to relevant weather bulletins, Advisories and Warnings, which are updated in response to the latest phenomenon observations or predictions. The criteria for Emergency Warning issuance were determined in response to the views of local governments in charge of disaster management for their own areas. 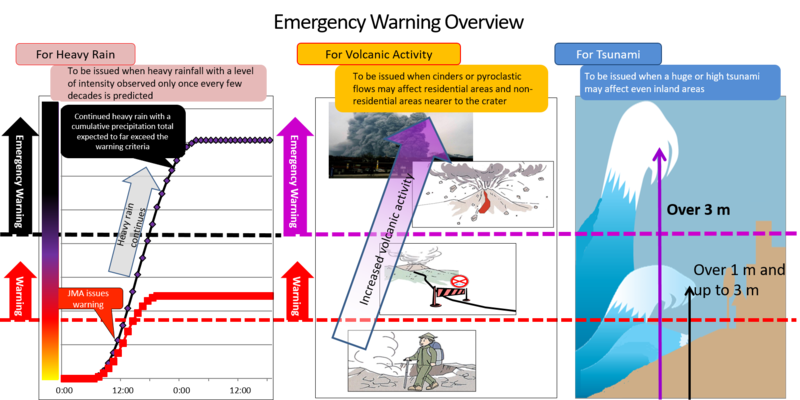 In regard to earthquakes, tsunami and volcanic eruptions, JMA maintains the system of warning nomenclature used until 29 August, 2013 but issues messages in the new classification of Emergency Warnings for high-risk conditions. 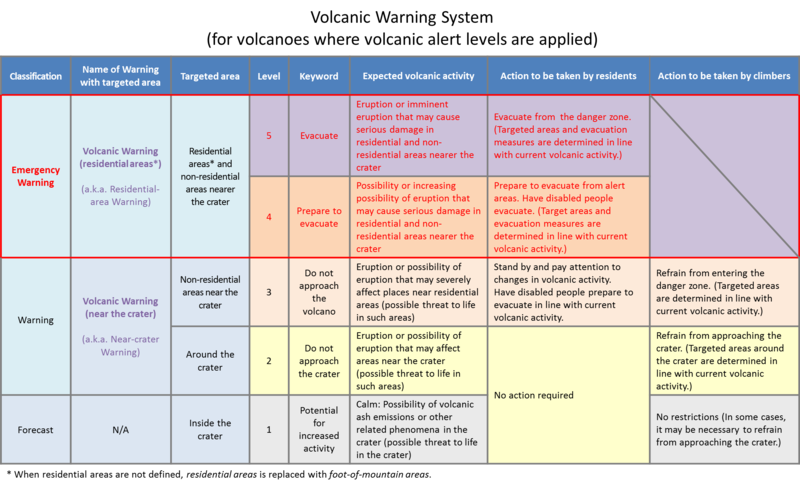 These include Major Tsunami Warnings, Volcanic Warnings (Level 4 or more) and Earthquake Early Warnings (incorporating prediction of tremors measuring 6-lower or more on JMA's seismic intensity scale). Take all steps possible to protect yourself if an Emergency Warning is issued. An extraordinary phenomenon of a magnitude never experienced by local residents is likely to occur. Take immediate action to protect life. The possibility of a catastrophe is high even if the area has not experienced a disaster for several decades. Do not let your guard down. Evacuate immediately to a safer place such as high ground or a tall building designated as an evacuation center. Evacuate or prepare to evacuate from alert areas. Earthquake Early Warnings incorporating prediction of tremors measuring 6-lower or more on JMA's seismic intensity scale will be issued in the classification of Emergency Warnings. The action to be taken will not change. Remain calm and secure personal safety based on your surroundings.